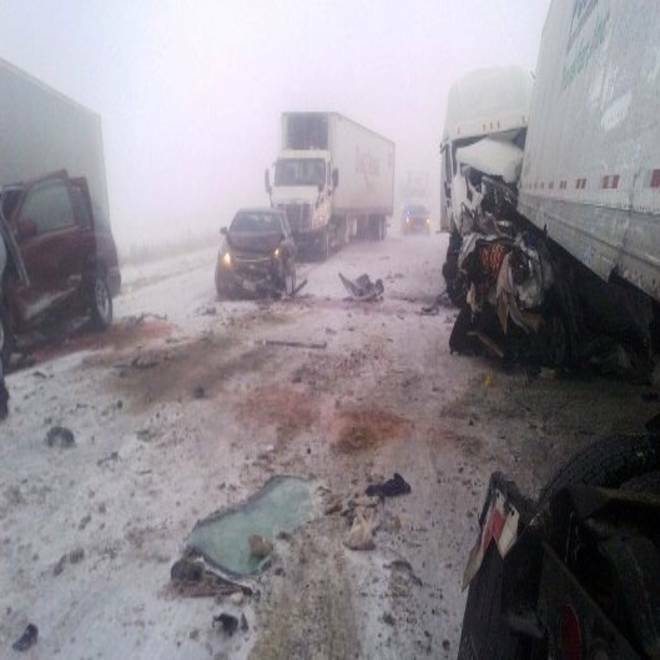 Some of the vehicles involved in a pileup on Interstate 35 in Iowa are seen Thursday. Two people were reported killed in the crash. After nearly a decade of decline, U.S. highway fatalities appear to be on the upswing again, according to new government data, with the death total climbing faster than at any time since 1975. The 7.1 percent jump during the first nine months of the year has safety experts scrambling for an explanation, though at least some of the blame may go to the economy, with more Americans driving longer distances as their personal financial situation has improved, post-recession. “There is a relationship between the economy, gas prices, driving and fatalities,” noted Jonathan Adkins, deputy executive director of the Governors Highway Safety Association. “However, the increase can’t be explained solely because of an improving economy and more discretionary driving. According to the National Highway Traffic Safety Administration, an estimated 25,580 Americans were killed in motor vehicle crashes during the first nine months of 2012. That was approximately 1,700 more than died during the same period the year before. Traffic fatalities fell to their lowest level in more than six decades during 2011, according to a study released by federal regulators earlier this month. The death toll was a still-significant 32,367, but that was down from 43,510 as recently as 2005, when a variety of factors began a dive in highway fatalities. Last year’s tally was not only the lowest overall total since the late 1940s but saw fatalities fall to a record low based on deaths per 100 million miles driven. According to the NHTSA, motorists did log more miles during the first three quarters of 2012, but the increase of 14.2 billion miles, or 0.6 percent, doesn’t come close to accommodating the overall rise in the death toll. On a miles-driven basis, fatalities rose to 1.16 per 100 million miles compared to 1.09 for the same 9-month period last year, and 1.10 per 100 million miles for all of 2011. Safety officials have been lamenting the steady increase in the number of states, such as Michigan, that have recently abandoned helmet laws. While fatalities among those in passenger vehicles has been dropping sharply in recent years, motorcycle deaths have risen markedly. Also up are pedestrian deaths, with the government reporting a 4 percent rise for 2010, the most recent year for which statistics are available. The increase in traffic during the winter may also have had a disproportionate impact on the overall fatality rate. Significantly, roadway deaths rose 13 percent during the first quarter of 2012, while the increase was a more modest 4.9 percent during the warm third quarter. NHTSA officials have been warning that what Department of Transportation Secretary Ray LaHood has called an “epidemic” of distracted driving” could reverse recent downward trends. But the agency has not weighed in on whether it is linking such problems as texting while driving with this year’s rise in highway fatalities. Yet to be seen is whether increased freeway speed limits are implicated. But despite some concerns as states continue to relax those limits – Texas opening the nation’s fastest roadway, at 85 mph, this autumn. However, previous years showed little direct linkage, the death toll dropping even as most states had approved steadily higher speeds.